So Marie sent in this pattern envelope (from Vintage Martini), with the note "just look at their expressions!" To which I say, "and how!" Obviously this is a still from one of those screwball movies that involve twins. This one's plot is that the mother of the twins can only afford to allow one girl a fancy debut, so she's pretending that the other twin doesn't exist. So, in this picture, spoiled Twin A (Billie) is off to the dance in her dress, while Twin B (Millie) sulks at home, in a housecoat. However, later, when Billie falls ill (food poisoning, milked for comedic effect), Mama has to beg Millie to fill in for Billie so that Rich Suitor won't be distracted by Billie's nemesis, the unscrupulous grass-widow Carlotta. Rich Suitor then falls for Millie, of course, and after many, many, MANY misunderstandings and some French-farce-type runnings in and out of rooms, they have a double wedding. The End. Won't someone go back in time and film this for me? kthxbye! I would also love that movie to have been made. With Cary Grant. Just because I think he should be in all screwball comedies. I am very fond of the “There’s TWO of her!” genre of B&W movies. I particularly love it when the twins are played by Olivia de Havilland or Bette Davis, and one’s good and the other is just pure evil.Also, is it me, or, do the girls on the pattern have really tiny heads? They DO have small heads and now that you brought it up I can’t not notice it. Also the pattern envelope states, oh so blithely, “Simple to Make”. Noting the buttonholes and placket that must be made, the V neck and collar details as well as those bows on the sleeves and fancy pockets, I must say, “not bloody likely.” But it would be worth it if after all the effort I got to marry Jimmy Stewart or Cary Grant. I love the “story” you gave the pattern picture. Fun! That tear in the envelope makes it look like Millie has a tattoo on her leg. Is that how Rich Suitor finally tells them apart? Billie will marry Carlotta’s brother so she will have to attend the double wedding in a fumming snit! Umm, do we really think she’d go to the dance in a ‘brunch coat’? To me it looks like an unwearable nightgown, at first glance, so I suspect it isn’t really a dress for an event. Not sufficiently structured for a dress of the period, and those shoulder things would be crushed is she wore a coat. Oh, your story line is a pure hoot! Wonderful! As to the “tattoo” on the leg, it’s possible the screwball comedy you describe was actually a re-edited version of a sci-fi film that didn’t go over well with preview audiences. In the initial effort, Jean Arthur played both an impoverished debutante AND HER ROBOT TWIN, “Dancing Debbie”, that had a manufacturer’s bar code on its leg. The robot was produced to let the deb go to twice as many dances that season (in foggy London), therefor widening her chances at snagging a wealthy suitor to keep funding her mad grandfather’s secret experiments. But the robot got jealous, etc. etc. If looks could kill!! !Love the story! You have it down to a T! Gotta say:Love the pockets and the long, full sleeves, hate the dress/housecoat/greenhouse/military tent combo. That look coudl peel paint off walls. I’ve seen my mother flash that one. PS: It might have been Kay Kendall, not Jean Arthur, who was in the original Dungeon of the Dancing Debs. What a great movie it could of been. My heart longs for those days of pure movie magic. There are no longer the truely amazing actors to play those parts. I guess if I could wave my magic wand it would be Cary, and kate Hepburn or maybe Audrey. Or possibly George Sanders. There were so many. I don’t know of one today who has the stlye and class of the greats.Is it a house coat?Sigh………i may have them confused. The one I see as a house coat has a matching hat. I believe the proper term for the floral dress would be hostess gown. I’ve heard older people talk of them, but none of them ever wore them. They felt if someone came to call, the least you could do was be properly dressed!But I think it could be a pretty going out dress – depending on the fabric. I love those old houserobes, they were so elegant. Maybe Hugh Grant could play the rich, bumbling, self-absorbed suitor.how about Kristen Dunst for the twins? 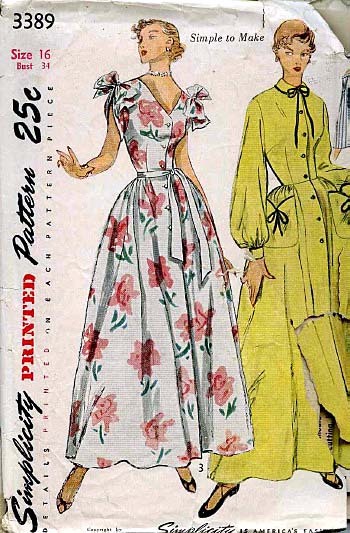 Oh, it’s totally a hostess gown; as it happens, I collect hostess gown patterns. Because … I don’t know why, actually. Because the ones I collect are actually the very fitted ones that have GINORMOUS POCKETS, so that they fit, yet I can carry stuff? Anyway, although the well-brought-up ladies in the 50s wouldn’t wear them as going-out-of-the-house dresses, this woman will, you betcha. Ginger Rogers and Lucille Ball wore similar frocks….hostess garb. Of course, we all dress for breakfast/brunch, don’t we?? You always make me giggle with your pattern illustrations stories! You do such a good job!